Traumatic amputations were probably uncommon until heavy iron and steel weapons evolved, with fingers and hands especially vulnerable. Apart from axes, cold steel weapons proved incapable of amputations at higher levels.All changed dramatically in the 15th century when destructive gunshot wounding, associated with in-driven foreign material, often led to mortal sepsis. 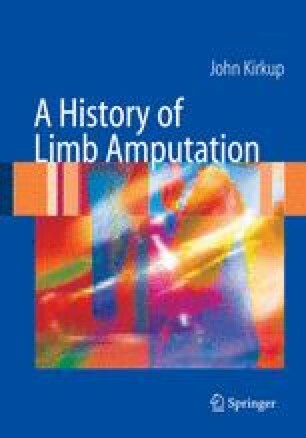 This battlefield enigma eventually stimulated elective amputation through sound flesh to save life and provide a healed stump. In parallel, methods of haemorrhage and infection control were addressed although not resolved before the 19th century. Doubts about boiling oil are expressed, and battlefield logistical problems are noted.